Our Floating Gemstones Necklaces celebrate earth's creations, delving into the beauty of topaz and opals, carnelians and moonstones, pearls and more. Simply braided onto a pretty silk cord, semi-precious stones seem to levitate like morning dewdrops on autumn spider webs. 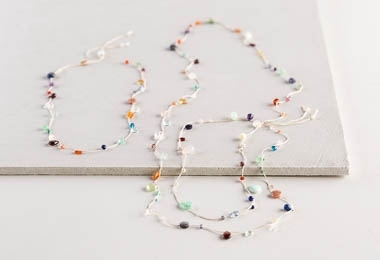 Our Floating Gemstones Necklace Pattern walks you through the steps of creating these ephemeral beauties, from threading and spacing the beads to creating a braided loop closure. Use our beautiful selection of Small, Medium, and Large Gemstones (although please note, not all the beads that are included in our Floating Gemstone Necklace Kit are available separately), plus Purely Silk's Silk Beading Thread. Click Product Details, above, for more information.